I've been reading and re-reading a 17-page eGullet thread about macarons, the French almond meringue-like cookie often sandwiched with a buttercream filling. 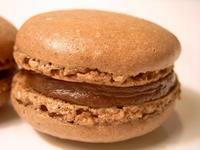 Before we go further, I want to distinguish between macaron and macaroon. The latter are an American confection, usually a gooey coconut cookie but sometimes a dense, chewy almond cookie. Neither of those describes the French version. The French version is much like a meringue. The outside is crisp but the inside is chewy. I've seen the chocolate ones described as the best brownie you've ever eaten. However, I've never eaten a macaron before. For all I know they're crap and I'm wasting my time, my egg whites, and more importantly, my expensive almond meal. But that eGullet thread has been calling me for months. I recently accumulated several egg whites, got some almond meal at a health food store, and decided it was time. 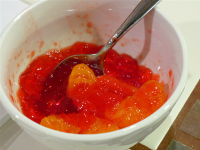 While perusing the eG thread for about the tenth time I noticed that one person mentioned using a recipe from Sweet Miniatures. I got excited - I could kill two birds with one stone! I could make progress on the book, yet make these cookies I've been drooling over for months. 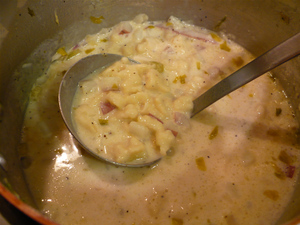 Since I've read dozens of recipes and discussions on the web, I compared Flo's recipe to them. 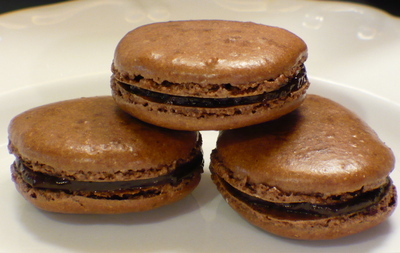 Hers is for a chocolate macaron (which she calls macaroons - I suppose she is writing for an American audience, but I tire of having things dumbed down for me). The proportions and ingredients seem pretty close to many other recipes - so far so good. Egg white, powdered sugar, almond meal/flour (I've seen it written both ways, and I'm not sure which is more accurate), and cocoa. That's it. Since I read a lot of horror stories about making macarons, I decided to get my act together and have a thorough mise en place. This is the most organized I've been for a recipe in a long time. It really does make the final process so much easier; I really should do it this way all the time. But often I don't and sometimes I forget an ingredient or something. Bad Darcie. Macarons seem fraught with potential disaster, from cracked tops to wrinkled tops, voids between the shell and the interior of the cookie, no rise, too much rise, no "feet" and other hazards. This is why I waited so long to try my hand at these confections. There are three things in Flo's recipe that I found unusual, but I proceeded with her instructions anyway. The first is that she has you sift the almond meal/flour (actually she instructs you to grind almonds in the food processor, but I already bought the durn meal), powdered sugar and cocoa together to blend and remove any lumps. This is not unusual, but she has you use the bits left over in the strainer. 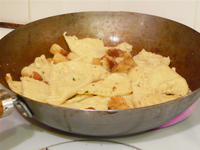 Most recipes call for any pieces too large to fit through the strainer to be discarded. I hoped that the resulting cookie wouldn't be too grainy. The second thing that struck me was her instruction regarding oven temperature. She has you use 475 degrees Fahrenheit initially, turning down the thermostat 25 degrees every 2 minutes until you reach 350. If ovens lost temperature at 25 degrees every 2 minutes, set at 475 it would take only 36 minutes to reach room temperature with the door closed. I don't think so. On the first batch I decided to open the door every couple of minutes to help the temperature go down. It seemed to work pretty well. For the second batch, I decided to bake them at a lower temperature and not bother with it. They turned out practically the same, so there's one less hassle for next time. The third thing wasn't really a defect in the recipe so much as that I disagreed with how it was written. 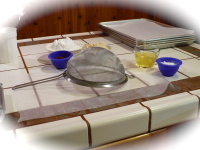 Flo instructs you to put parchment on a baking sheet, then pipe the batter into rounds on the sheet. After that you are to put the baking sheet in another sheet for insulation. Why not just put two sheets together in the first place? So much easier, plus, if you didn't have enough sheets for a full recipe, you might not catch that until you're ready for the oven. But I guess that is a minor complaint. 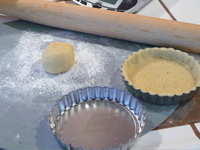 On with the baking. One instruction in many recipes that I found unusual is that the cookies are to sit for at least 30 minutes after piping before they are baked. This is to allow a "skin" to form on the cookies which will ostensibly keep them from cracking and/or rising too much. Many recipes also call for the batter to "flow like lava." I find that funny because how many people have actually seen a lava flow? I've seen it on TV, but that really doesn't make me an expert on how it flows. Perhaps a trip to Hawaii is in order, just in the interest of making the perfect batter. I was striving for macaron perfection, like the cookie shown here. I felt unlikely that I would achieve it my first time, since these cookies seem to be finicky. Also, most people say that the best recipes call for an Italian meringue (a hot sugar syrup poured into beaten egg whites which creates a very stable meringue) as opposed to a regular meringue like Flo uses. I didn't get perfection, but they weren't terrible either. 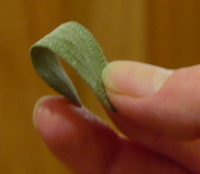 I got little "feet" on the bottom (what the frilly edge is called), but they deflated a bit upon standing. The tops were smooth and not cracked, which is good. All in all they were good for a first effort. I had read that these are very difficult to remove from the parchment. Most recipes call for putting the cookies in the freezer to aid in removal, so that's what I did, although Flo doesn't instruct you to do so. I tried pulling one cookie off the sheet before freezing, and a lot remained on the parchment. After freezing, they came off much more cleanly. You can see my results at the top. They really do taste like an excellent brownie. Some people say these taste better after ripening in the fridge a day or two. I'll let you know - if they last that long. Remember all those strawberries I bought 10 days ago? They've been hanging out in the Debbie Meyers Green Bags since then, and I'm happy to report that although a few of them are getting squishy, not one of them has molded or gone nasty. Mongo impressed. 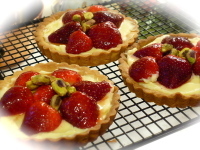 But I still need to use them up, so yesterday I made some individual strawberry tarts for a small dinner party. I used the Cook's Illustrated Fresh Fruit Tart recipe, and it was spectacular. 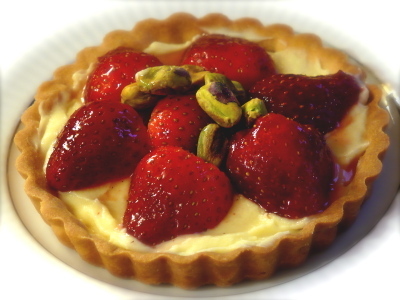 Everyone liked all the parts - the pastry, the cream, and the fruit. Recently some folks in the CI bulletin board indicated they were having trouble with the pastry cream from this recipe not being firm enough. I wish I could help them figure out what's wrong, because it sure isn't the recipe. I have made it several times with great success. This time I even tried a few things to see if I could make it runny, just in the interest of troubleshooting, but it set up firm despite my efforts at sabotage. I tried under cooking it a bit, then over-stirring it at the end. It's still perfect. The tart crust is an excellent, firm but tender pate sucree (I sure wish I could figure out how to get diacritical marks on Typepad...). I need to work on my decorating ability, but even with sloppy berry placement the individual tarts were an impressive end to a fine meal, which consisted of a smoked turkey (sorry, I forgot to get photos! ), stuffing, mashed potatoes, green beans, and two salads. Plus one friend brought a bottle of rum and some Coke, so there was happiness all around. Back to the berries. In the fridge right now I have a custard chilling for strawberry ice cream. I wasn't in a snap-happy mood today, so I don't have any photos of making the custard. It's just as well since I screwed up a little and smooshed the strawberries too much. Oh well, I'm sure it will taste great, tomorrow. It will be too late tonight to churn, since I'm about ready for bed now. Boy, I remember when I was only getting started at 9:30 (and it wasn't that long ago!). I've been wanting to find more uses for my favorite Christmas present, my waffle cone/pizzelle iron. 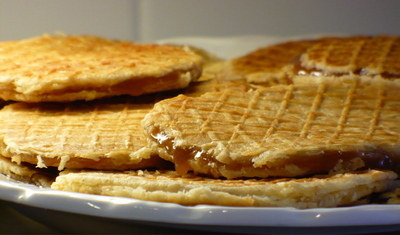 Recently I came across a recipe for stroopwafels, which are pizzelle-like cookies filled with caramel. That sounded delicious, so I searched several recipes and found one that looked promising. I was surprised to find most of the recipes called for a yeasted dough. I was assuming these were basically Dutch pizzelles, but they are, indeed, a different animal. 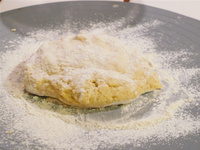 I gathered the ingredients together and began the preparation. It never ceases to amaze me how many different results you can get from fat, flour, sugar and leavening. The possibilities are nearly boundless - puff pastry, croissants, all manner of cakes and cookies. It's kind of like Taco Bell. They combine and recombine six ingredients to come up with a full menu. But what I'm talking about is much better than running for the border. 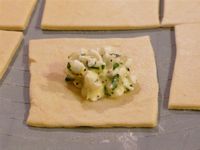 This recipe begins with cutting cold fat into flour, as in a pastry crust, and adding the liquid ingredients to form a dough. The liquid is mostly water, with eggs, sugar and cinnamon added to the mix. I tossed in a pinch of salt because I believe a little salt adds a boost to the flavor of baked goods. My mom disagrees and her stuff tastes great, so what do I know. 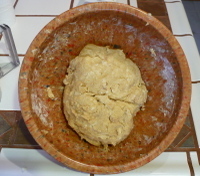 The dough that resulted was very shaggy looking. The recipe didn't call for any kneading, so I just mixed it by hand until it was cohesive and all of the ingredients were fairly evenly distributed. I set it aside for a one hour rise while I made the caramel filling. The filling has a lot of butter, as do the wafels - each has half a pound. This is for a recipe that is supposed to make 12 wafels. Yikes! Time to start that exercise program (maybe tomorrow). In addition to the butter, the caramel has brown sugar, dark corn syrup, and more cinnamon. 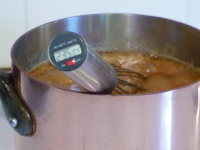 It is to boil until reaching the soft ball stage, which is from 234 to 240 degrees Fahrenheit. I always push my caramels to the top end of the temperature range because I like them to be thicker and have a more robust flavor. You will note my ultra-cool thermometer whisk in the photo. I love that thing! I need to order a replacement because I have no doubt I will kill this one by dropping it or accidentally putting it in the dishwasher. Once the caramel reached 240 degrees, I poured it into a bowl to stop the cooking. I set it aside to cool to room temperature so I could spread it on the wafels. After an hour, the dough hadn't risen much at all. I decided to give it another half an hour and see what transpired. It's such a heavy dough with all that butter so it rises very slowly. The recipe I found didn't have very detailed instructions, so I didn't know if it was supposed to double or just rise a little. I didn't want to wait any longer so I pushed ahead. The next step involves the waffle iron. You form the dough into balls and press in the iron. After making the first one the size called for in the recipe, I decided to make these half the recommended size. They were the size of dessert plates, and loaded with that much butter even I couldn't eat a whole one. OK, maybe I could, but I shouldn't. I also determined that I couldn't latch the iron shut because the resulting wafel would be too thin to cut in half, which is the next step. So I just pressed down until there was about an 1/8-inch gap in the iron, and cooked them for a minute or two. I then flipped the wafel over pressed again and cooked each a bit more, since the back end was thinner than the front due to the hinge on the waffle iron. This step made them even. A floating hinge would be better, but I haven't seen one made that way on a pizzelle/waffle cone maker. I guess they don't think you will do other things with it. The wafels were surprisingly easy to split. Each was filled with about a tablespoon of the caramel, which is pretty dark due to the dark corn syrup. 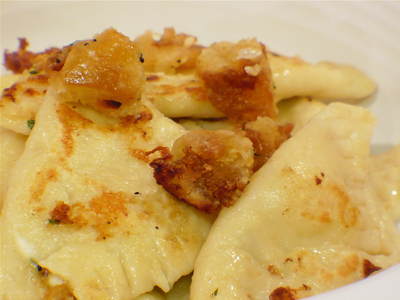 This is a great recipe for experimenting. For one wafel I crushed a few lavender flowers into the caramel after spreading it on the cookie. It was heavenly. I was also thinking about doing a coriander/chile caramel and, of course, a maple/bacon caramel. That would make a dandy breakfast stroopwafel. I am taking the plate full of wafels seen at the top of the page over to the neighbors since I have already eaten three today and will continue to eat more as long as they are available. I don't have any willpower when it comes to delicious desserts. These are fairly time consuming since you can only cook one at a time, but they are worth it. The only thing I noted on the negative side was that the cinnamon flavor was quite muted, although my hubby said they smelled very cinnamon-y while I was making them. I found it lacking but that could be due to this lingering head cold. Hopefully it will be totally gone soon. Coming soon - bacon pics! 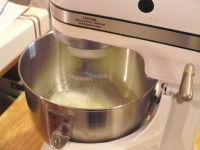 Box mixes are famous for engineering cake with ultralight texture. We set out to make an even fluffier cake—without chemicals and additives...Adapting a chiffon technique (using a large quantity of whipped egg whites to get a high volume and light texture) to combine the ingredients from our butter cake recipe worked beautifully, creating a light, porous cake that was hefty enough to hold the frosting’s weight. 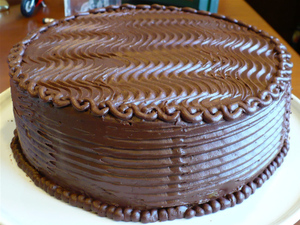 But the cake lacked moistness and some tenderness. Using a combination of fats (10 tablespoons of butter plus 3 tablespoons of vegetable oil) kept the butter flavor intact while improving the moistness of the cake. 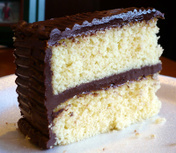 I would like to point out that for about a year, I had been touting a change I made to the CI white layer cake recipe that I felt made a substantial improvement. I substituted several tablespoons of the butter in that recipe with vegetable oil and found it greatly improved the texture of the cake, especially after refrigeration. The fact that this recipe also uses a combination of fats is probably just be a coincidence, but I like to flatter myself with the belief that one of CI's test cooks read my notes and borrowed the idea. While I remain in fantasy land, I want to add that I think my cake turned out prettier than CI's. 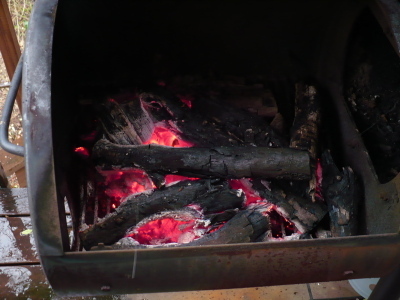 At left is the photo from Cook's Illustrated website, and mine is on the right. I thought that the cake was pretty darn good and I will make it again, even though I sure dirtied a lot of bowls making it. It might be as fluffy as a boxed cake mix, but it's definitely not as easy. But since I can't stand the chemical aftertaste of a boxed mix, I think it is worth the effort. I used a cake comb to make a pattern in the icing but my cake wasn't as level as I thought it was. The lines needed to be touched up and didn't turn out as smoothly as I would have liked. However, I've decided that since I don't bake cakes often enough to have the icing turn out flawlessly, I won't berate myself for messing up. It has made cake decorating a much more pleasant pastime. My cakes aren't showpieces, but they're sure attractive enough to eat! A few swirls at the top edge and some dots at the bottom and I called it an evening. My husband liked the cake scraps that he ate after I trimmed it, and I enjoyed the piece I had for breakfast (!) this morning. Looks like a light lunch is in order. The cake lived up to its billing, very light and fluffy. The crumb was pretty good - not too coarse (the problem I have with boxed mixes), but not quite as tight as a traditional cake. 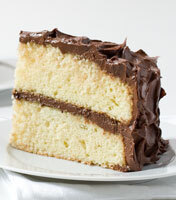 The frosting complemented the cake very well. This one's a keeper. 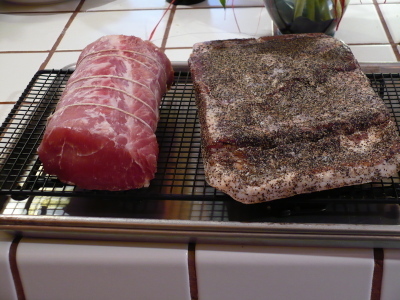 Tonight I started the first two projects I will make from Charcuterie. 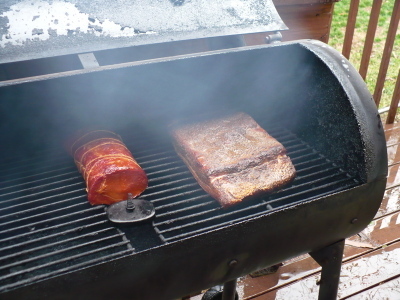 I bought some skin-on pork belly, and had a pork loin hanging out, so I decided to make two kinds of bacon - American and Canadian. 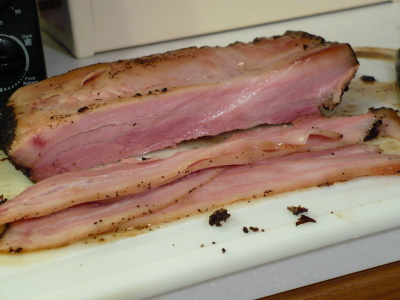 When my husband found out which cut is used for Canadian bacon, he joked, "Those Canadians sure eat high off the hog." Har-dee-har-har. Bacon sure seems simple enough. First, you get pork belly (which is one of the hardest parts around here). You rub it with a cure that includes salt, pink salt (sodium nitrite), sugar and whatever seasonings you wish to add. 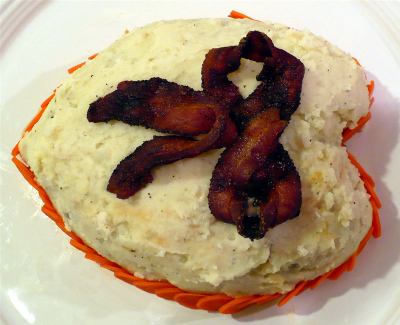 We decided that peppered bacon would be great. 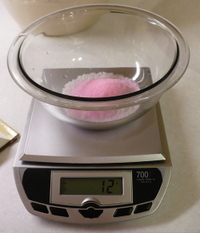 Pink salt is a very pale, feminine pink. I can't believe that self-respecting, manly butchers chose this color on purpose. Maybe their wives suggested it. I know, I know, it makes the meat an attractive color in a way that blue, for instance, wouldn't. But it's just so - pink. Once you rub the belly with the cure, you put it in a bag and refrigerate it for about a week, or until the meat is firm. 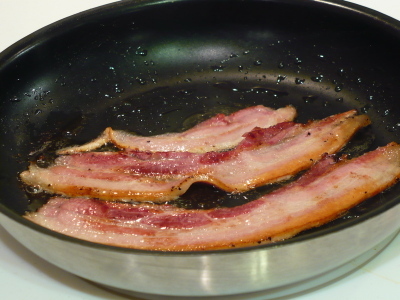 Every day you flip the bacon over to evenly distribute the brine that will form. I used a foodsaver bag, but didn't make a vacuum seal. The instructions don't call for it, and I figured that it was better to err on the side of caution, since anaerobic bacteria are pretty nasty and I didn't want to have my first batch of bacon spoiled. 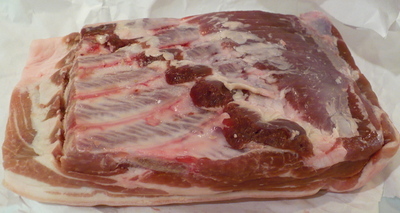 While that went into the fridge for curing, I prepared the brine for the Canadian bacon. The instructions call for a "bunch" of thyme and a "large bunch" of sage leaves. I have no idea what that means so I guessed. I'm not a huge sage fan so opted to use just a few leaves. An aside on these leaves - I layered them in a container with kosher salt many months ago. I expected them to be dry and brittle but as you can see, they are flexible. It's a great way to keep sage when the weather gets cold and your plants are about to freeze. The photo is a little out of focus - sorry about that. I haven't completely figured out the new camera. 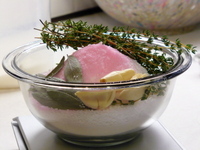 In addition to the sage and thyme, the brine has kosher salt, sugar, garlic and pink salt. The instructions direct you to heat the liquid to dissolve the sugar and salts, then cool it in the fridge before adding the meat. I opted to just use part of the water to dissolve the salts and sugar, add the rest of the room temp water and add ice cubes to hasten the cooling process. Time is precious! And I am lazy! The pork loin swims in the brine for 48 hours, so until then I'll just have to cool my heels. 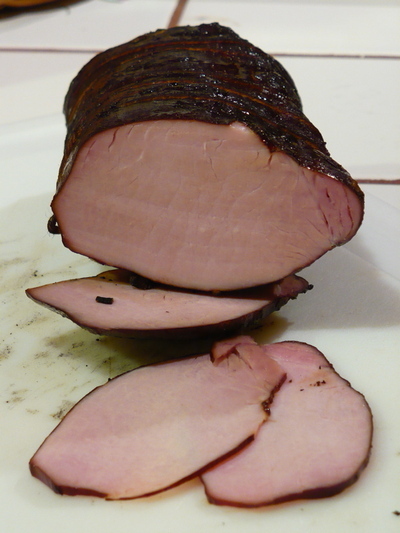 You can smoke the Canadian bacon, but Michael Ruhlman and Brian Polcyn (the authors of Charcuterie) say you can get acceptable results just roasting it in the oven. I might just do that since I don't know if I want to play with the grill this week. Stay tuned - results to follow! Sorry it's been so long between posts, but I've been battling a hell cold. With the weather outside very blustery and the temperature dropping several degrees every hour, I decided some baking was in order. I've had a hankerin' for granola recently, so I decided to whip up a batch. Granola is very easy, and so much better than what you can buy, that anyone who even remotely likes it should make it for herself, even if baking isn't her forte. 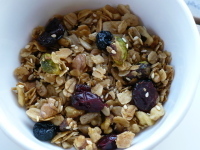 I use the basic proportions of a Cook's Illustrated recipe, but granola is very accepting of ingredient substitutions. Now I wouldn't go so far as substituting tuna, say, for the oats, but you can use any type of nuts, seeds, or rolled grains you like. I just saw some rolled rye flakes in the health food store that I thought might be interesting in granola. Here are the proportions and the ingredients I used to make today's granola.